Representative Rapp welcomes 120 soldiers from Company C of the elite 56th Stryker Brigade Combat Team to the new state-of-the art Bradford Readiness Center during the official ribbon cutting ceremony. Located at Bradford Regional Airport, this 28,000 square foot training facility strategically combines Army and National Guard units from the former Bradford and Ridgway armories in support of the Army's highly versatile Stryker armored combat vehicle. 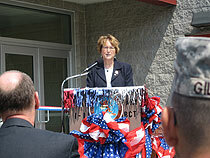 Rep. Kathy Rapp (R-Warren/Forest/McKean), a member of the Pennsylvania House Veterans Affairs and Emergency Preparedness Committee, was honored to welcome 120 soldiers from Company C of the elite 56th Stryker Brigade Combat Team to the new, state-of-the-art Bradford Readiness Center during Thursday’s official ribbon cutting ceremony. “With approximately 15,000 members of the Pennsylvania National Guard and Reserve proudly serving in extremely dangerous conditions both at home and around the globe, it is now more important than ever that we provide them with the best possible training facilities,” said Rapp. Located at Bradford Regional Airport, this 28,000 square foot readiness center strategically combines Army and National Guard units from the former Bradford, McKean County and Ridgway, Elk County, armories in support of the Army’s highly versatile Stryker armored combat vehicle. Weighing in at 19 tons, the Stryker is designed to provide America’s armed forces with a family of 10 different vehicles that can be readily deployed by C-130 aircraft and instantaneously combat ready upon arrival on the battle field. Called to active duty and sent to in Iraq in September 2008, the 56th Stryker Brigade was part of the largest, history-making combat deployment of Pennsylvania troops since World War II. In August 2005, members of Company C were deployed in Louisiana to deliver humanitarian aid to Hurricane Katrina victims as part of Operation Independence Relief. With 2,500 square feet more than the two older armories in Bradford and Ridgway combined, the Bradford Readiness Center contains an assembly hall and kitchen space, battalion and company administrative space, classrooms, locker rooms, storage and an arms vault.